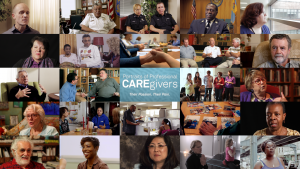 CAREgivers: Their Passion, Their Pain is a documentary film which takes us on a journey into a world the public has not seen. The film depicts the dramatic emotional costs experienced by professional providers such as nurses, social workers, clinical psychologists, doctors, firefighters, first responders who rescue, assist, and when possible heal the injured and traumatized. We hear from providers on a) how they are affected emotionally and physically and b) the ways of coping and recovering from toxic stress in the workplace. We thank LivingBetterWithMindfulness.com and Walnut Hill United Methodist Church for helping us bring the CAREgivers film to Dallas. for helping us bring the CAREgivers film to Dallas.